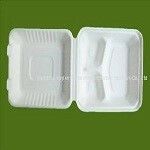 Our Sugar Cane Clamshell are made from sugarcane fibers. This annually-renewable resource is made into compostable products with a similar look and feel to paper. Unlike Styrofoam, our Sugar Cane Clamshell will completely compost under commercial composting conditions in just 45-60 days.